I asked each blogger to pick a flower that spoke to them in some way and create an outfit inspired by it. The flower they choose does not have to grow during the month of May, just any flower that they love and inspired them. I will be back to regular blogging on Monday, May 16. When Tiffany asked me to guest post for her while out traveling, I was honored! After all, we fashion chicks must stick together, right? It's been sooooo crazy busy that I took this photo a few weeks ago (bashful face), but alas, I still love this dress and still find it very relevant for the springtime ahead of us. I never wear red. I was always taught that redheads (although I am actually strawberry blonde!) just do not wear red. Well, over the past several years I've found out - hey, I can look good in red! And it's inspired by my favorite flower of all - the red tulip. 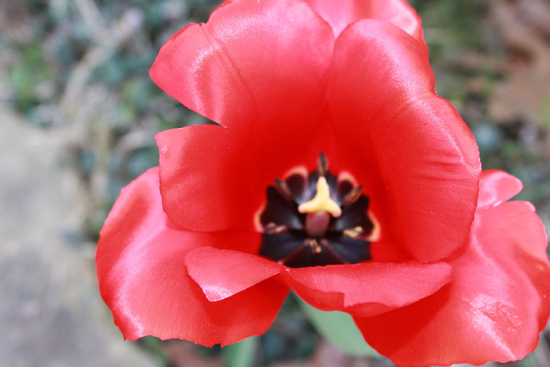 You just can't get more vivid, gorgeous color than a red tulip. And this one opened up just for me! Air kisses from I Heart Heels!